Spend a week in Panama deepening your yoga practice, disconnecting from the stress of everyday life and reconnecting to what makes your mind, body, and soul sing. Take the time for some much-needed rest, reflection, healing, and transformation with twice daily Ashtanga yoga, overlooking the Pacific ocean, fresh healthy meals, a guided waterfall tour, intro to surfing class and much more. Morning meditation, pranayama, and led or mysore style Ashtanga Yoga at the oceanfront Yoga Shala. Delicious and healthy breakfast is served from 7-10 am. Avocado toast, chai oatmeal—yum! Afternoons are free to rest by the salt water pool, have a spa treatment, or explore with one of Sansara's many adventures. 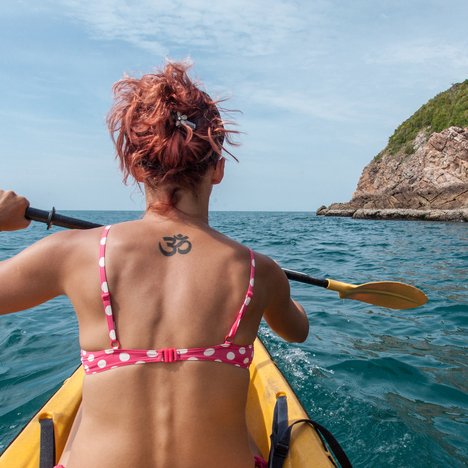 Complimentary SUP's, kayaks, snorkeling gear, bikes, and one on land surf lesson is included. Other excursions of hiking, fishing, horseback riding, catamaran and estuary tours can be organized. Surf board rentals and packages are available. This is a wonderful time to take your surfing to the next level. Please inquire upon registration. Lunch is served from 12-2. Poke bowl or tacos anyone? Sunset yoga session: restorative yoga, yin yoga, alignment based movement research, yoga sutras, chanting, and different forms of deep relaxation including Yoga Nidra. For dinner, enjoy a farm to table experience with only the best locally sourced ingredients. Time to relax and enjoy the community. 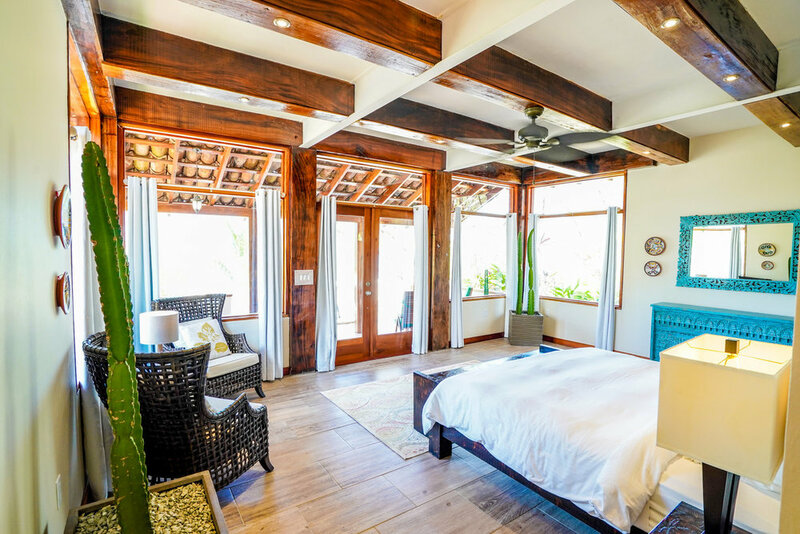 Enjoy pure luxury in one of the eleven private oceanfront cabanas that have incredible tropical hardwood furniture and original art that has been locally sourced and made. Designed to inspire serenity, the zen-like atmosphere of Sansara blends seamlessly with the lush nature and quiet beauty of the property’s grounds. Featuring extraordinary views of tropical gardens, each cabana has its own private patio which is steps away from the Pacific Ocean’s warm waters. Each room includes air conditioning, ceiling fans, mini fridge, free wi-fi, safe for your valuables, daily housekeeping, organic bath products, and organic hypoallergenic linens. Kimberly has been leading retreats and combining her love for travel and Ashtanga Yoga for over 15. After years of traveling all over the world to study yoga, she wanted to share with students the opportunity to immerse themselves in yoga, nature, community and adventure. The best part of leading a retreat for her is the balance between dedicated practice, adventure, relaxation and healing. Take a break to nurture your spirit and play along like minded yogis at the Sansara Resort. Overnight accommodations in Panama City on Saturday, March 15th and if necessary on Saturday, March 21st. A list of hotels will be provided once registered. Hotels range from $100-200 with breakfast included. If you would like to share a room, please let me know upon registration. Surf packages, designed to take your surfing to the next level. Hand crafted cocktails, designed to inspire the tropics, carefully made using only the freshest hand-pressed juices, house-made bitters and local rums and spirits. They also have a selection of local micro brewed beer and kombucha on tap! Space is limited. Please register early to secure your desired occupancy. This retreat will sell out. They do every year. $500 Non-refundable deposit is due to secure your spot and desired accommodation. Full payment is due 120 days prior to trip start date. All prices reflect individual rates. Email Kimberly for more details. Where the mountains meet the sea, located at the southernmost point of Panama in the Azuro Peninsula, Cambutal is a small village in the province of Los Santos, and is approximately five hours away from the country’s capital, Panama City. This quiet and nearly untouched area of Panama, provides the perfect backdrop for a relaxing retreat experience. Boasting beautiful and dramatic tidal changes, stunning mountainsides, an abundance of tropical vegetation, endless wild birds and monkeys swinging through the treetops, Cambutal is an ideal place to unwind and escape this winter. Sansara is in the beach community of Cambutal. There are minimal shops on the beach, which is part of the appeal. However, there are local corner stores, restaurants, and a coffee shop nearby. The closest neighboring town, 20-minute drive away, Tonosi, is where you can find an ATM, bigger grocery store, and a few clothing shops. You must have a valid passport to travel to Panama. Please check your passport expiration date and make sure it is valid for at least 3 months after the end date of your retreat. No immunizations are required for visiting Panama, however check with the CDC for recommendations. See more information here. All deposits are non-refundable and full payments are non-refundable within 120 days of the retreat unless your space can be filled. The purchase of travel insurance is highly recommended for this trip, which will protect you against potential trip delays or cancelations due to airline issues, family emergencies, illness, injury, etc. We recommend checking out www.insuremytrip.com for more info.